One day at the end of Last month, a group of students from the Massachusetts Institute of Technology created a Bluetooth-powered mouse that a woman with cerebral palsy could direct by sipping and puffing with her lips. Another group developed a head motion-activated system to turn pages of a musical score for a conductor, also with cerebral palsy, and still another group built a workout app that can help somebody with diabetes adjust their insulin after exercise. And that's just some of what the winners of the school's Assistive Technologies Hackathon (ATHack) accomplished. Fourteen other teams with a total of 70 undergraduate and graduate MIT students participated in the one-day hackathon to develop technologies and devices that would directly assist specific individuals with disabilities. The hackathon took place at the MIT Lincoln Laboratory Beaver Works in Cambridge, MA, a joint center operated by the MIT Lincoln Laboratory and MIT School of Engineering that leverages synergies between campus research and the laboratory's technology areas. "It challenged students to apply their technical skills to develop tools that would make a real difference in the quality of people's lives," said MIT senior Jaya Narain, one of the students who organized the event. The 17 teams started several weeks before the day of the hackathon by meeting with the clients to talk about what they might be able to do to help them live more independently. The clients had a range of disabilities, everything from cerebral palsy and diabetes to paraplegia and hearing and vision impairments. The day of the hackathon, a number of Lincoln Laboratory volunteers were on hand to make sure the students took advantage of everything that was available to them at the lab. "I have never seen the facility so teeming with innovation," said Beaver Works Manager John Vivilecchia. "Every inch of space was humming with activity." A six-member panel of judges, made up of Lincoln Laboratory engineers and MIT graduate students, evaluated the projects based on usability, creativity and functionality. Not every team's project was successful, but even those that weren't planned to continue to refine their prototypes. 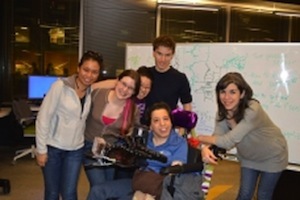 The winning project was the one that allowed a woman with cerebral palsy to use her computer mouse by sipping and puffing and second place went to the page turner for the conductor with cerebral palsy. "Disabled community members need to know that there is an ongoing commitment to solving the challenges they face," said Joseph Martini, director of assistive technology at the Perkins School for the Blind and one of the judges. "ATHack and similar events will hopefully influence more students to pursue projects and careers relating to assistive technology development."